Welcome to the first & only vintage guitar pick site on the internet! I hope you find what you're looking for and if not, perhaps you will in the future as I am always striving to attain more information on these no-longer-produced treasures. But first, let me explain a bit about how this all started. I've been searching for a definitive way to display/catalog my vintage guitar pick collection(as well as provide a complete referencing site for other collectors)--and this seemed like the most organized way to do that. I will attempt to provide accurate dates of production as well as a little bit of history for each brand/company listed if I am able to do so. Basically, though? D'Andrea made approximately 99% of the guitar picks made in this 'vintage' guitar pick era. This is why I'm so 'high' on D'Andrea products. Their beauty and skill with guitar pick creation is unparalleled. 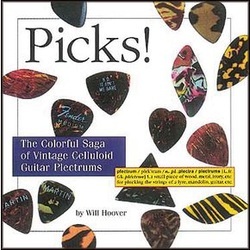 I am always looking for more and more information regarding the many vintage guitar picks in my collection(as well as looking for more vintage picks to purchase/trade). Any and ALL expertise would be greatly appreciated. So, if you have any info on any of the picks I've listed or corrections in faulty information(I'm still learning! ), feel free to email me at: APearson_65@yahoo.com. Thank you for looking! One more thing; I generally don't sell anything on my site, though I will consider trades from time to time. I have lots of doubles, triples, etc. of alot of my stuff. I am always up for trades--unless I only have 1 or 2 of a specific type. I always like to keep at least 2 of everything. And I am always looking to buy vintage guitar pick lots or even single vintage guitar picks/boxes!! Again, thank you so much for visiting this website and I hope you enjoy the information here as much as I do!! First and foremost is Brian Bouchard. I call him 'The King of All Picks Vintage', a title I feel he deserves. He, on the other hand, is very humble and disagrees w/the title I bestowed upon him!! I met Brian on Ebay and I consider him to be not only a great friend, but also an expert when I have questions that only he can answer. He has been so very generous to me and I owe him a great debt. He is the one from whom I bought my very first vintage guitar pick(and truly is responsible for providing approximately 99% of my collection). We have also traded in the past. And I am never disappointed by anything I have gotten from him. 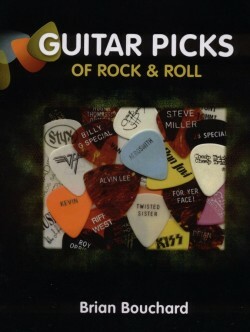 Brian is the editor-in-chief of Pick Collecting Quarterly and also the author of the book, 'Guitar Picks Of Rock & Roll'(VERY valuable to band guitar pick collectors)!!!! Brian's latest venture is OldPicks.com. Here you can find awesome little gems at great prices!! Secondly, I would like to thank Guy aka 'Coupe' DeVillez. He sold me my first Clifton Tu-Way guitar pick. Another pick I thought I would never own! And one occasion I will always remember Coupe for: Upon receiving this gorgeous diamond-shaped pick from Mr. DeVillez? I decided to see how it sounded actually USING it to play my guitar(can you say 'idiot/novice'??). Anyway, it sounded GREATER than I could've imagined--for the whole 2 1/2 seconds it held together before snapping in half. I emailed Guy of my plight[including a pic of the poorly handled pick]. And would you believe he actually sent me a replacement for free? Since then, Coupe has been an enormous asset to me. He holds a wealth of knowledge in the field of guitar pick collecting and without him, as well as Brian, my collection would be nothing. Coupe has talked to many many people in the guitar pick manufacturing world(including the D'Andreas!!) Again--thanks Coupe! And, last but NEVER least, I would like to thank the master of vintage picks, Joe Macey. Joe has tirelessly spent his time attempting to gain as much information as he can in cataloguing these little jewels. His knowledge is incredibly valuable to me in terms of dating, origin, and manufacturers of all the great little vintage guitar picks ever made! He has taught me how to spot vintage jewels merely by celluloid design, shapes, and printing. Mr Macey has also been a defining factor in the growth of my vintage pick collection. Especially rare Japan picks I NEVER thought I would own. In addition, Joe had made his own unique brand of guitar/mandolin picks called 'Playmore'. I invite you to visit this category included on this website. You will find various patterns, shapes, grips reminiscent of the Golden Age of guitar picks. Many are unique. And ALL are now part of guitar pick history. And I'm proud to display the Playmores I've acquired thus far!! There are several other wonderful people who provided vintage picks and/or invaluable information to me about my newly acquired 'treasures'. Thanks to Chris Hewitt(My FIRST Herco vintage picks! ), Pete, and Janie(who has a GREAT collection of Pickboy picks!!). And a special 'thanks' to Tony D'Andrea for his words of encouragement. Please forgive me if I've forgotten anyone else in this great community of people with GREAT taste in guitar picks!! Oh!! I can't forget the first man who inspired my addiction to guitar picks---yep, you guessed it!! The incredible Will Hoover!! I wish I could say I know him, as I know the rest of these great folks. Yet, even though I don't know this great man--I reference his book Picks! at least 4 times monthly. Any pick collector would be foolish not to purchase his invaluable book!! The link is below. You will NOT regret this purchase!! Thank you, Mr. Hoover for igniting my love for guitar & mandolin picks! !